Making the metaverse portable (with Plone)! One idea which is bouncing around among people interested in data portability is to only have one user account and freely go from service to service, taking your data with you. No need to signup again and again, importing your data again and again, finding your friends again and again and all that jazz. This vision seems to be somewhat away in the field of social networks (but we are fighting for it) but in the field of virtual worlds we are moving with big steps towards this goal! 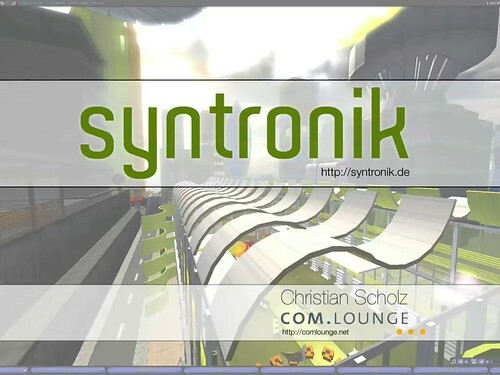 Today we (that is COM.lounge) launched syntronik.de, the first native Agent Domain implementation for the Open Grid Protocol based on Plone. This might not say much to you but let me explain it. What is the Open Grid Protocol? The Open Grid Protocol is developed by the Architecture Working Group founded by Linden Lab in September 2007. This protocol aims at breaking down the walls between virtual worlds, think of it maybe as the HTTP for the 3D internet. In the Open Grid Protocol there are Agent Domains which hold all the users with their profiles, groups, friends, etc. and there are Region Domains, the actual 3D environments. Given you have the permission the protocol allows you to freely connect from any Agent Domain to any Region Domain thus enabling a truly open and global virtual world. syntronik.de is our proof of concept of such an Agent Domain and it works! You can create an account and you can then use that account to login to any Open Grid enabled region. Right now there are about 30 of these regions listed for the Open Grid Public Beta program. This list is growing. After the initial teleport between grids done by Linden Lab and IBM engineers this is an important steps towards the goal of a global network of virtual worlds. The Open Grid Protocol is very much at it’s beginning but we are moving forward quickly. What is it built upon? As the basis for the actual website we used the CMS Plone. The reason is simple: An Agent Domain aims to be implemented on existing user bases such as those in social networks. Using Plone gave us the opportunity to find out how such an Agent Domain component can be developed in a non-invasive way. This means without changing much of the actual data model etc. I will write more about how we solved this in a future article. The other component we used was the pyogp library, an open source implementation of the Open Grid Protocol as it stands today. We are also heavily involved in the pyogp project. The Agent Domain component we developed for syntronik.de will also be part of the pyogp project. The source code will be released soon. The Agent Domain component will be part of pyogp, the Plone related component will be put into the Plone collective. This will then close the gap in the open source environment where the only missing open source piece was an Agent Domain implementation (The Second Life client is released under the GPL, Open Sim which is used as Region Domain is released under a BSD license and the Agent Domain component now is released under an Apache License). As said, this is a proof of concept. We will continue to work on this project on all fronts and would like people to join it. There is much to do in the specification of the Open Grid Protocol, in the implementation of it in pyogp and in the implementation of Agent Domains. It would be very cool of course would somebody also start a Region Domain or some sort of client based on pyogp. Maybe we can also influence the social networking scene with this work and vice versa. This at least is my personal goal. I would like to thank Linden Lab for starting this effort, the OpenSim team for creating an open source server, David Levine (Zha Ewry) from IBM for creating the initial patch for making OpenSim Open Grid compatible, the pyogp team, especially Locklainn Linden for doing a lot of coding and Lawson English (Saijanai Kuhn) for knowing everything about the protocol. And of course in general everybody helping to make the Open Grid a reality!